Modern lifestyles have increased our levels of forgetfulness. We've all forgotten something essential to our daily routine in a rush to leave the house to get to work or an appointment. It can be annoying or even wreak havoc on your day. How might we create an IoT object that will help the user avoid forgetting essential items as they rush out of their home every day? 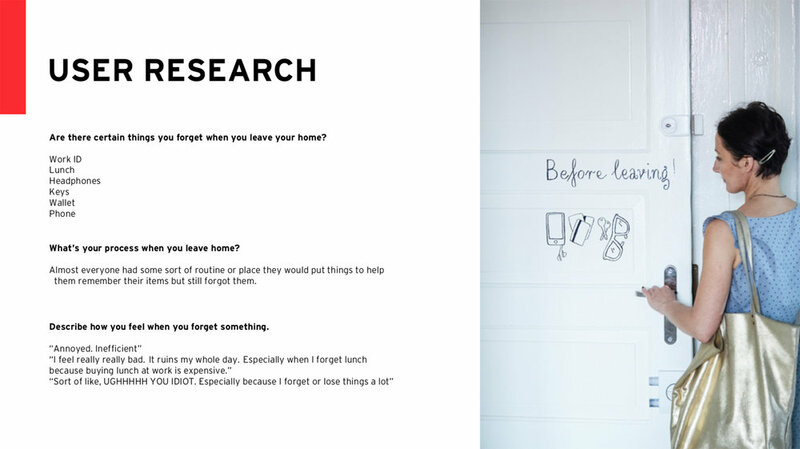 RECALL is a smart doorknob that helps you remember things you typically forget. It fits into the ecosystem of successful smart home / lifestyle products such as Nest and Tile. While most smart doorknobs focus on locking and unlocking the home, RECALL focuses on making sure you have one less thing to think about. Rather than ruin your day, make you late, or feel more stressed for forgetting something, RECALL makes sure you don’t leave your house without all of your essential items. It is intended for those in a rush who often forget important daily items like their phone, keys, wallet, watch, glasses or lunch. The RECALL smart door knob can easily replace the interior doorknob on any entrance door. When the RFID does not sense the proximity of the tag, a corresponding icon will turn on in bright orange, signaling to the user that they are missing something they might not want to leave home without. LCD display is programmable with the RECALL app so that each user in a household can use it independently with no confusion. Before you leave your home, the doorknob will read your fingerprint, which will then trigger the sensors revealing any forgotten items by lighting up the matching icons notifying the user to grab the items before leaving. Future iterations would be able to tell the weather and inform the user whether or not they need an umbrella or even sunscreen. Almost everyone had some sort of routine or place they would put things to help them remember their items but still often forgot them. Continue to develop app for onboarding and pairing. How was the general user experience? Do you think it actually helped you in term of the problem of forgetting things? What do you think about the physical appearance of the product? How was your interactions with the RECALL door knob different from your doorknob at home? Future models could utilize wi-fi capabilities to show the weather on the LCD display.